DVDFab has sent out a newsletter announcing DVDFab Prime. 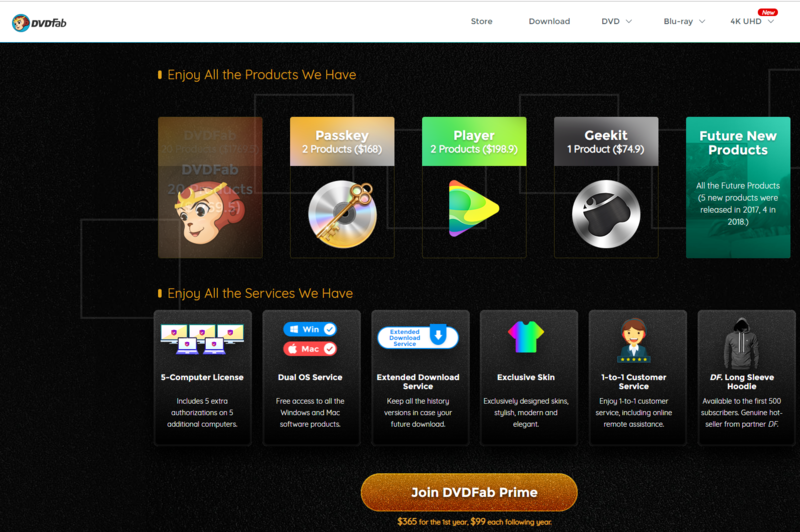 With this membership, users get access to all DVDFab software products that are already released and that will be released in the future. With Prime comes a license to install DVDFab software on 5 different PCs and the first 500 new members will get a DVDFab long sleeve hoodie. Included in the DVDFab Prime package is access to DVDFab 11, Passkey 9, Player 5, Geekit and all future products DVDFab might release. According to the software company the value of the package exceeds $2,000 if all products had to be purchased separately. DVDFab Prime members also get extra perks, such as a license that can be used on 5 computers, free access to all Windows and Mac software, an extended download service, exclusive skins, 1-to-1 customer service and a DVDFab long sleeve hoodie for the first 500 customers. Also, future services that DVDFab might offer are included. Existing DVDFab All-In-One users can get DVDFab Prime for $99 for the initial year and $99 for each following year. Other users pay $365 for the first year and then also $99 for each following year.